Rangers goaltender Henrik Lundqvist, who was playing in his second game within a span of 24 hours, kept the Blueshirts in range of the Hurricanes for much of the night and finished with 35 saves. After thoroughly dominating the Toronto Maple Leafs in a 7-0 win at Madison Square Garden on Wednesday night, the Rangers stumbled in the back end of playing two nights in a row, falling to the Carolina Hurricanes 4-1 at the RBC Center on Thursday night. Despite the loss, the Rangers remain in sixth place in the Eastern Conference with 57 points, although the ninth-place Hurricanes now sit only five points behind them and are holding two games in hand. Trailing 3-0 in the third period, the Rangers snapped Cam Ward’s bid for a shutout after 51 minutes of play. Brandon Prust collected his own blocked shot and rifled the rebound past Ward from the slot for his sixth goal at 11:40 to bring the Rangers within two and give the visitors some life down the stretch. Rookies Chad Kolarik and Ryan McDonagh both assisted on Prust’s goal, as each recorded his first NHL point. Kolarik -- playing in his first game as a Ranger after being recalled from the Connecticut Whale to replace the injured twosome of Brandon Dubinsky and Ruslan Fedotenko -- earned his first point in his third NHL game. McDonagh’s initial NHL point was produced in his eighth game. 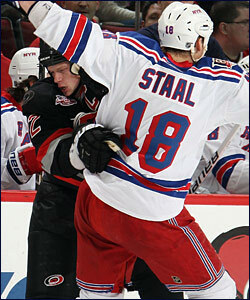 Rangers defenseman Marc Staal collides with his older brother, Eric, in front of the Rangers bench on Thursday. The next time the brothers will share the ice at Raleigh, N.C., will be at the upcoming NHL All-Star Weekend, where Eric is a team captain. The Hurricanes quickly squelched any thoughts of a Rangers comeback when rookie Jeff Skinner scored his 17th goal from in front with 4:09 remaining to play in regulation. In backstopping his seventh shutout of the season 24 hours earlier, Lundqvist faced a total of 22 Maple Leafs shots, only 13 of which came over the first two periods of play. In stark contrast, Lundqvist faced 16 shots alone in the wide-open first period on Thursday night. Carolina’s Chad LaRose and Jussi Jokinen were also able to do what no Toronto player could do the night before in scoring against Lundqvist, putting the Rangers in a 2-0 hole after one period. LaRose opened the scoring at 5:39, showing excellent hand-eye coordination in batting a Skinner pass out of midair and chopping the puck off Lundqvist and into the net from five feet out on right wing. Nine minutes later, Carolina took advantage of the period’s only power-play opportunity for either team when Jokinen deflected Joe Corvo’s heavy slap shot into the cage at 14:43. Despite surrendering a pair of goals, Lundqvist turned in a strong opening period as many of his 14 saves were of the difficult variety. In fact just 30 seconds into the game Lundqvist made a sensational one-on-one right-pad stop on Jokinen from point-blank range. Lundqvist then received some help when Dan Girardi swiped Jokinen’s rebound attempt off the goal line and cleared the puck away. The Rangers also had their chances to score in the first, but Ward was extremely sharp in denying a team that was skating with confidence offensively after scoring seven times the night before. Ward made 11 saves in the opening period, including a strong pad stop on Artem Anisimov after the Rangers’ center broke in behind the defense following a neat chip pass from Sean Avery two minutes into the contest. 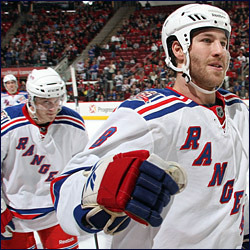 Rangers forward Brandon Prust skates back to the bench after scoring the Blueshirts' lone goal in the third period. Behind Prust is rookie Chad Kolarik, who picked up his first NHL point with an assist. Ward was just as sharp in the second, stopping all 14 Rangers shots in the middle period. Anisimov -- coming off a four-point game against the Maple Leafs -- continued to challenge Ward, firing a team-high seven shots on goal on Thursday. And Kolarik also showed plenty of jump, making the most of his limited ice-time by creating several very good scoring chances that required difficult saves by Ward, and finishing with four shots on goal. And another recent newcomer to the team -- forward Kris Newbury -- also had much life in his game on Thursday, highlighted by his second-period fight with Carolina’s Ryan Carter in which Newbury buried his opponent in a flurry of punches. Despite the energy provided by the new faces on the team, the Rangers entered the second intermission trailing 3-0 after Carolina scored the only goal of the middle period. Brandon Sutter netted his eighth after gaining a step on Marc Staal and Anisimov before slipping a backhand shot past Lundqvist at 5:41. Tortorella believed Sutter’s goal was the most important one scored in the game. The next challenge for the Rangers comes Saturday night when they face the Eastern Conference’s eighth seed, the Atlanta Thrashers, in the middle game of their current three-game road trip.